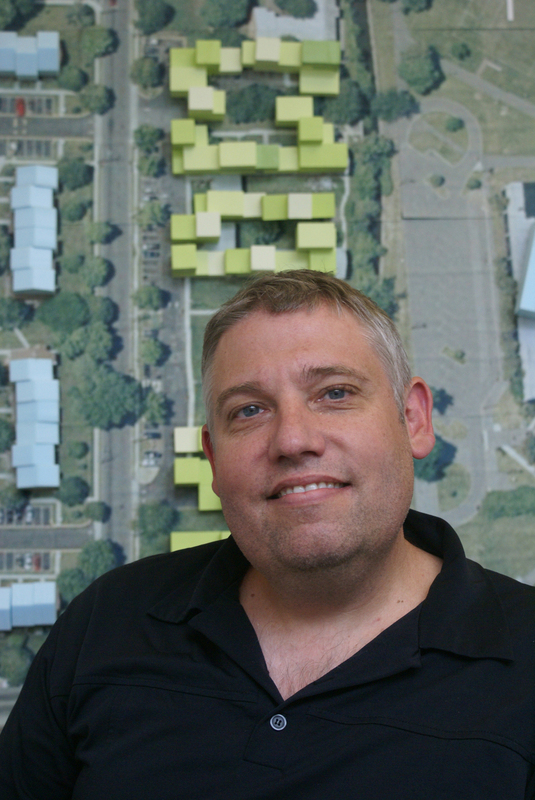 Jeffrey Johnson is a registered Architect in the State of New York and a member of the AIA. He received his Master of Architecture in 1992 and his Bachelor of Architecture in 1990 from Ball State University. Following graduation, Jeffrey Johnson worked for offices in Vienna, Austria and Chicago before locating in New York in 1994. In New York, Jeffrey Johnson worked in various offices including Asymptote and Michael Sorkin Studio. From 2001 through 2003, Jeffrey Johnson worked as project architect for OMA/Rem Koolhaas in Rotterdam, The Netherlands, and New York City, during which time he completed the McCormick-Tribune Campus Center at the Illinois Institute of Technology, in Chicago and the Lehmann Maupin Gallery in New York. In 2003, he co-founded SLAB architecture with Jill Leckner. Johnson was awarded an AIA Presidential Citation in 2012 for his work on the National September 11 Memorial and Museum. In addition, Jeffrey Johnson is an adjunct professor and is the founding director of China Megacities Lab, an experimental research unit at the Graduate School of Architecture, Planning and Preservation at Columbia University. His research focuses on the radical transformations of China’s urban landscape. Current projects include research on the megablock, the basic DNA of large-scale urban development, which will be included as part of a book he is co-editing on the subject entitled The China Lab Guide to Megablock Urbanisms. Johnson most recently has been researching the museumification of China, which takes a critical look at the current museum building boom. He has lectured extensively and has taken part in numerous international events, symposia, forums and workshops on the topic of cities and China’s urbanization. In addition to teaching at Columbia University, he has also taught at the Illinois Institute of Technology and was a Visiting Professor at Tongji University. Jeffrey Johnson was the Curator and Co-Academic Director for the 2013 Bi-City Biennale of Urbanism / Architecture in Shenzhen. Jill Leckner is a registered Architect in the State of New York. She received her Master of Architecture in 1995 from Columbia University and her Bachelor of Architecture in 1992 from Ball State University. In 2003, she co-founded SLAB architecture with Jeffrey Johnson. Jill Leckner worked for Christian Hubert Studio from 1998 to 1999 as the project architect on the exhibition ‘The American Century: Art & Culture 1950-2000’ at the Whitney Museum of Art and on the Leo Castelli Gallery. From 2002 until 2006, she worked for Asymptote during which time she was project architect for several internationally recognized projects including the Carlos Miele Flagship, the 9th International Architecture Exhibition at the Venice Biennale, and the Guggenheim Guadalajara Museum Competition.